Heat the oil in a 12-inch skillet over medium-high heat. Add the beef in 2 batches and cook until it's well browned on both sides. Remove the beef from the skillet. Reduce the heat to medium. Add the garlic and onions to the skillet and cook until the onions are tender-crisp. Stir the Italian sauce into the skillet and cook for 15 minutes. Return the beef to the skillet and cook for 5 minutes or until the beef is cooked through. 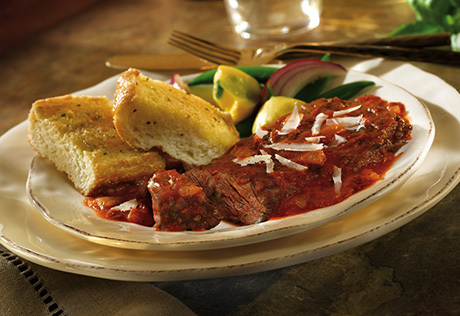 Cut the bread into 2-inch diagonal slices and serve with the beef and sauce. Sprinkle with the cheese, if desired.